The most telling aspect of the Late Paleocene Event is the divergent data. The ooze on the Shatsky Rise at ≈ 32° North has an outlier δ18O high spike. The ooze on the Maud Rise at ≈ 66° South has an outlier δ18O low spike. But only the Maud Rise at ≈ 66° South has a discernible δ13C spike. Maud Rise is an oceanic plateau located in the Southern Ocean. Maud Rise formed part of the south-eastern African large igneous province (LIP) which developed south of Africa 100 to 94 million years ago (Ma). Although these observations are subject to interpretation the divergent nature of the data is very suggestive of a catastrophic impact event. 1) The Shatsky Rise δ18O high represents a Northern temperature low. 2) The Maud Rise δ18O low represents a Southern temperature high. … way back in 1953 the awfully clever Epstein et al created a formula that turns the natural world upside-down by defining an non-linear inverse relationship between δ18O values and temperature for calcium carbonate between 9° C and 29° C.
a) The Shatsky Rise δ18O high represents a Northern temperature high. b) The Maud Rise δ18O low represents a Southern temperature low. The divergence in δ18O values is a mainstream embarrassment. But the δ13C values are a catastrophe. The downward spike in δ13C values in the Maud Rise oceanic ooze at ≈ 66° South suggests there was a sudden upturn in biological activity. This upward spike in biological activity isn’t linked to a rise in temperature. Plankton inhabit oceans, seas, lakes, ponds. Local abundance varies horizontally, vertically and seasonally. The primary cause of this variability is the availability of light. A secondary variable is nutrient availability. The upturn in biological activity found in the Maud Rise oceanic ooze is [most likely] associated with the [temporary] addition of iron because “in the Southern Ocean, iron appears to be a critical limiting micronutrient”. Despite significant macronutrient concentrations, some ocean regions are unproductive (so-called HNLC regions). The micronutrient iron is deficient in these regions, and adding it can lead to the formation of phytoplankton blooms. The Southern Ocean is the largest HNLC region in the global ocean. 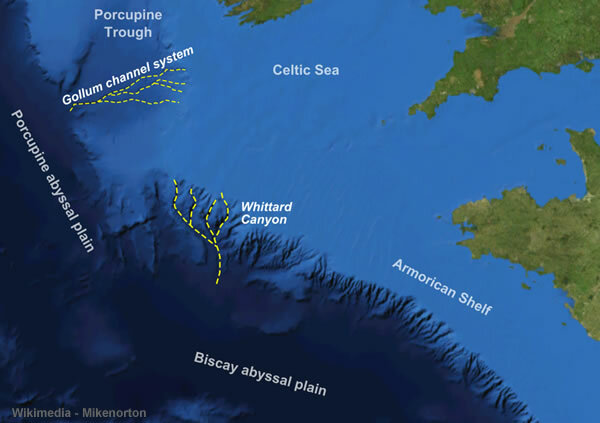 The surface waters of the Southern Ocean have been widely identified as being rich in macronutrients despite low phytoplankton stocks. Macronutrients present in Southern Ocean surface waters come from upwelled deep water. While micronutrients such as zinc and cobalt may possibly co-limit phytoplankton growth in the Southern Ocean, iron appears to be a critical limiting micronutrient. John Martin (1935-1993), was an oceanographer. He is also known for advocating the use of iron fertilization to enhance oceanic primary production to act as a sink for fossil fuel carbon dioxide. 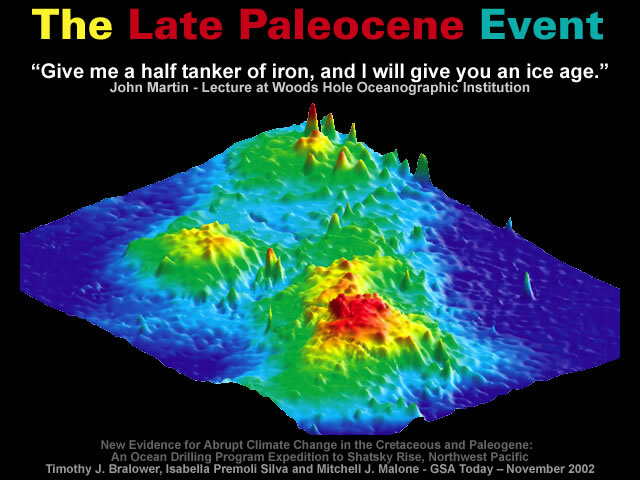 “Give me a half tanker of iron, and I will give you an ice age.” – John Martin, from a lecture at Woods Hole Oceanographic Institution. The additional iron suggests an inbound iron object disintegrated over the Southern Ocean. The Campo del Cielo iron meteorites provide tangible support for this line of argument. This area is situated on the border between the provinces of Chaco and Santiago del Estero, 1,000 kilometers (620 mi) northwest of Buenos Aires, Argentina. The crater field covers an area of 3 by 18.5 kilometres (1.9 by 11.5 mi) and contains at least 26 craters, the largest being 115 by 91 metres (377 by 299 ft). The craters’ age is estimated as 4,000–5,000 years. The craters and the area around contain numerous fragments of an iron meteorite. The total weight of the pieces so far recovered is about 100 tonnes, making the meteorite possibly the heaviest one ever recovered on Earth. The largest two fragments, the 37-ton El Chaco and 30.8-ton Gancedo, are among the heaviest single-piece meteorite masses recovered on Earth, along with the 60-ton Hoba and a 31-ton fragment of the Cape York meteorite. While, the disintegration of large “stony” bolides has the potential to create localised firestorms and regional cooling due to debris/dust being suspended in the atmosphere. The North East aligned Río Cuarto craters in provide support for this line of reasoning. The Río Cuarto craters are a purported group of impact craters located in Córdoba Province, Argentina. Research published in 2002 indicates that they are more likely a result of Aeolian processes. There were ten depressions, four of them of substantial size. One depression, named the “Drop”, was about 200 metres (660 ft) wide and 600 metres (2,000 ft) long. Two more large depressions, the “Eastern Twin” and “Western Twin”, both about 700 metres (0.43 mi) wide and 3.5 kilometres (2.2 mi) long, were located 5 kilometres (3.1 mi) to the northeast. Another major depression, the “Northern Basin”, about half and again as big as one of the Twins, was sited 11 kilometers further to the northeast. The long axes of the depressions all point to the northeast. 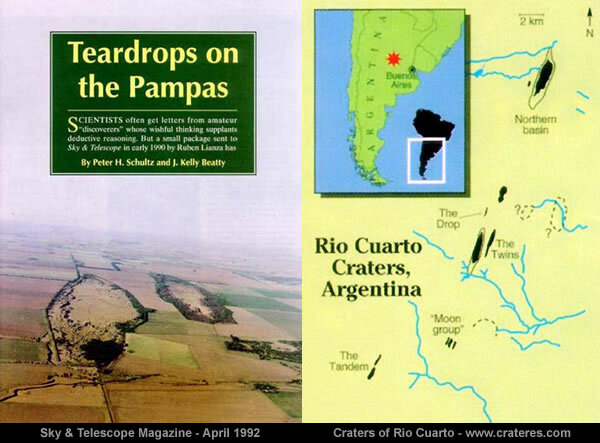 Models of the Río Cuarto event suggest that the object struck at an angle of no more than 15 degrees from the horizontal, with the impact itself having 10 times more explosive energy than the Barringer Crater event and 30 times more than the Tunguska event. The object came in from the northeast, as bright as the Sun. The object hit ground at the Northern Basin, creating a mountain of fire about 10 kilometres (6.2 mi) wide and 50 kilometres (31 mi) long, and scattered off pieces that went downrange to form the Twins and the Drop. The fireball incinerated all life downrange in a firestorm with a parabolic-shaped footprint that created hurricane-force winds, erasing the butterfly-shaped pattern of debris characteristic of such low-angle strikes. A bolide is an extremely bright meteor, especially one that explodes in the atmosphere. An achondrite is a stony meteorite that does not contain chondrules. 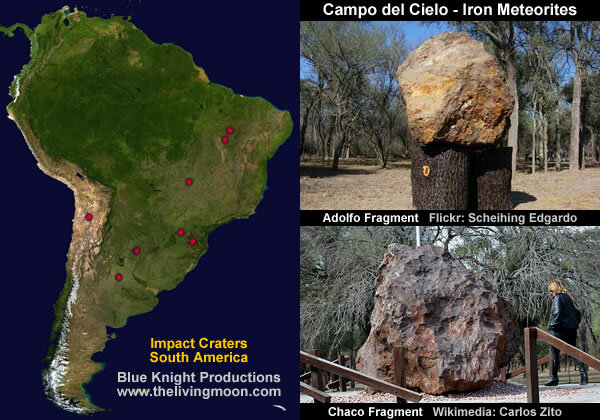 Interestingly, the South American impact sites have a pronounced North East alignment. 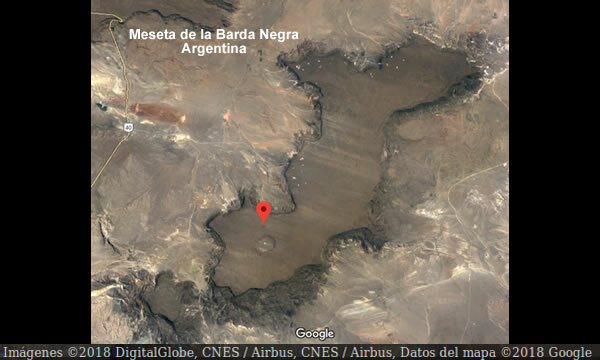 The crater of the Meseta de la Barda Negra (Coordinates: 39° 10′ S 69° 53′ W), was found in the province of Neuquén, (Argentina), after intense searches from the images of the Landsat satellite, with the aim of finding other craters apart from those already discovered in the country (Campo del Cielo and Río Cuarto). From the satellite you can see a crater 1.5 km in diameter, isolated in the middle of a huge basaltic brown plateau. The crater of the Black Barda Plateau has an elevated rim with respect to the floor of the plateau itself. This leads to the conclusion that it is an explosive crater. Proof of this are the rocky blocks of 50 or 60 m that rest on the crater or on its edge. This North East alignment is echoed in the Atlantic Ocean. This North East alignment is also echoed by the Vitrified Walls that stretch across Europe and into South American. Overall, the evidence suggests the Earth has been impacted by a series of iron and stony objects that were probably created by The Other Big Bang. The first of these impacts probably occurred around 600 CE +/- 40 years. This heralded the arrival of a period of upheaval when many of the inland seas drained away into the widening oceanic basins. The [divergent] δ18O data values suggests the Late Paleocene Event only occurred in 1389 CE – that’s not entirely unreasonable for superficial deposits of ooze. 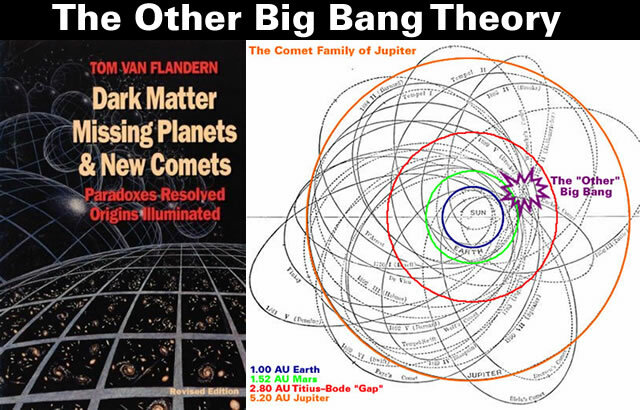 a) The Shatsky Rise outlier δ18O high. b) The Maud Rise outlier δ18O low. The 1389 CE dating of the Late Paleocene Event coincides with the extinction of the Moa. The moa were nine species (in six genera) of flightless birds endemic to New Zealand. The two largest species, Dinornis robustus and Dinornis novaezelandiae, reached about 3.6 m (12 ft) in height with neck outstretched, and weighed about 230 kg (510 lb). It is estimated that, when Polynesians settled New Zealand circa 1280, the moa population was about 58,000. Moa extinction occurred around 1300 – 1440 ± 20 years, primarily due to overhunting by Māori. When will Gradualism [and it’s shoddy Settled Science] become extinct? Another curious coincidence is the North East alignment of the Shatsky Rise. Gallery | This entry was posted in Arabian Horizon, Astrophysics, Atmospheric Science, Catastrophism, Dallas Abbott, Earth, Geology, Inflating Earth, Old Japanese Cedar Tree, Science, Solar System, Uniformitarianism, Vitrified Hill Forts. Bookmark the permalink. Louis Hissink provides a very intriguing insight into the extinction of the Moa. Given the Maori legend that the Moas were extirpated by heavenly fires, corroborated by Australian Aboriginal legends about the Aurora Australis extirpating many of their people during the recent past, it seems likely the Roman Empire was terminated by a globally extensive coronal mass ejection-like thermal catastrophe subsequently memorialized as religion’s hell-fire. More details from Peter Mungo Jupp. Curiously, the timing of this event may be related to Maori legend of the fires of Tamatea. This was around the time the Maoris settled New Zealand. On the South Island is evidence of giant fires and Mega Tsunamis that burnt the forests and wiped out the now extinct giant Moa bird. Carbon dating of these burnt remains primarily cluster around the mid fourteenth century. According to Bryant, Maori legends talk of fire from the heavens and the extinct giant Moa bird as one who was destroyed by a strange fire. Here there appears to be evidence for an airburst that flattened trees in a manner similar to the Tunguska event. The remains of fallen trees are aligned radially away from the point of explosion out to a distance of 20 to 40 miles. Bryant maintains local Maori legends in the area tell about the falling of the skies, raging winds, and mysterious and massive firestorms from space. This appears to be the referenced Bryant source. In the past decade over ten major tsunami events have impacted on the world’s coastlines, causing devastation and loss of life. Evidence for past great tsunami, or ‘mega-tsunami’, has also recently been discovered along apparently aseismic and protected coastlines. With a large proportion of the world’s population living on the coastline, the threat from tsunami can not be ignored. This book comprehensively describes the nature and process of tsunami, outlines field evidence for detecting the presence of past events, and describes particular events linked to earthquakes, volcanoes, submarine landslides and meteorite impacts. 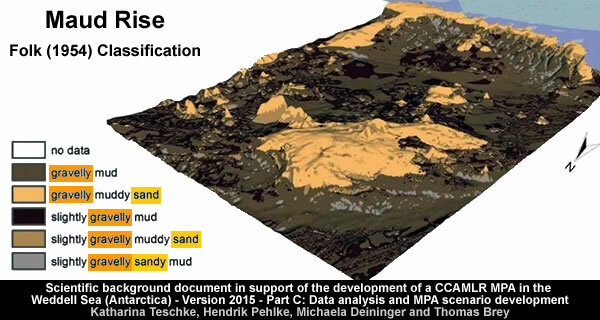 However, radiocarbon dates, history, Maori place-names and legends are subject to interpretation. 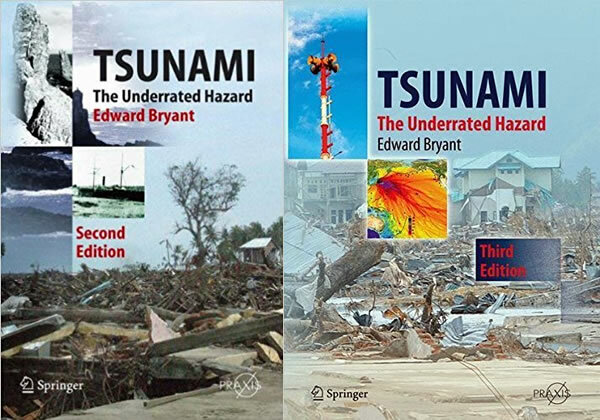 “Mystic Fires of Tamaatea” is the title given to a section of a book entitled “Tsunami: The underrated hazard” written by Edward Bryant and published by Cambridge University Press in 2001. In it the author links New Zealand evidence for widespread forest destruction and Maori place-names and legends with the 15th century timing of an apparent Tunguska-type meteor impact in the South Island of New Zealand, Chinese, and Japanese meteor sightings, comets , and “mega”-tsunamis in Australia. This paper critically reviews the lines of evidence used , and finds no evidence, either Maori or geological, for a 15th century meteor impact in New Zealand. In the book, all Maori place-names have been incorrectly translated, the radiocarbon chronology is incorrect, and there is no consideration of the numerous potential tsunami sources that were active in New Zealand in the 15th century. Bryant’s critics are right – there is no evidence for a Tungusta meteor event in the South Island of New Zealand. However they also cannot locate any Maori story about fire in the sky killing the animals, but interpreting the Maori language seems to be highly subjective. It’s necessary to read Bryant’s referenced texts before any further comment is possible.